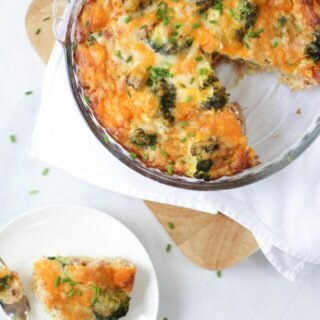 An easy and delicious Crustless Quiche recipe. Quick, simple and healthy, this recipe is also Gluten Free, Low Carb and Slimming World friendly. This recipe makes a brilliant dinner, packed lunch or brunch dish. Heat the oil (or Fry Light) in a frying pan over a medium heat. Add the onions and cook for 3 or 4 minutes until starting to soften. Add the broccoli and cook for a further 4 or 5 minutes until that is starting to soften too. Put the vegetables into a shallow dish, add the ham and pour over the beaten eggs. Sprinkle over the cheese and plenty of salt and freshly ground black pepper. Bake for 25 - 35 minutes until the quiche is cooked through but is still a little wobbly.